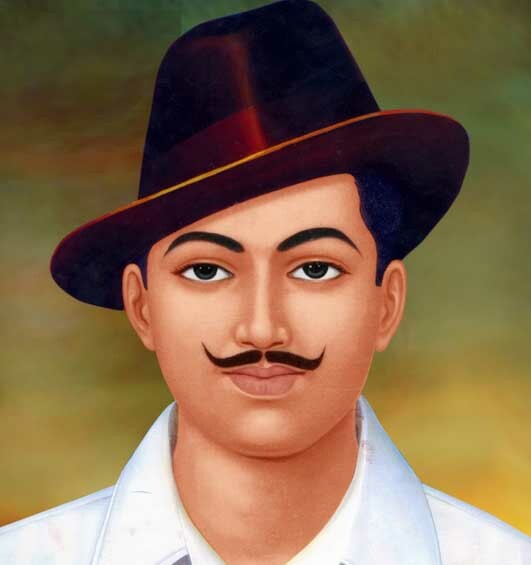 Bhagat Singh was born on 27th September 1907 in Banga village of Lyllapur District, Punjab (present-day in Pakistan), famous as aplace place of residence of Khlsa Sikhs. His parents were dedicated patriots and revolutionaries. His father, Kishan Singh was an ardent follower of Arya Samaj, just like his father Sardar Arjun Singh and used to perform social work for the needy and poor. Sardar Kishan Singh played an immense role during the plague in Vidarbha. He took with him 25 orphan children to Ferozepur and established the first orphanage for them. Bhagat Singh’s mother, Vidyawati too was a bright woman patriot and a devoted wife. Bhagat Singh’s prosecution and he getting hanged at the mere age of 23 made him a household hero. Every child aroused in himself the bravery and gallantry of the young lion of Punjab, who thought not even once before sacrificing his life for the benefit of the nation. The land of five rivers, Punjab famous for its contributions of courage and valour against the atrocities of Mughal and British Empires, marked its presence in the history with the blood of yet another son of the land. 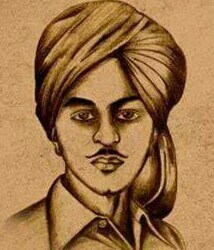 In 1907, when Sardar Bhagat Singh was born there were two groups operating the country for freedom from the shackles of the alien rule of Britishers. One was a group of moderators, boycotting foreign goods as a mark of their protest. The other one was a group of radicals, involved in not shying away from using violence as a means of obtaining freedom. Bhagat’s uncle, Sardar Ajit Singh was the leader of the radicals in his area and his father, Sardar Kishan Singh was the movement’s staunch supporter. Both uncle and father were in jail when Bhagat was born but released soon after his birth. Thus, Bhagat was considered a fortunate infant. The home environment was full of patriotism and revolutionary activities. When Bhagat was just three years old, his father took him to the field where several peasants were sowing mango seeds. Bhagat soon got down from his father’s lap and began running in whole field, stumbling, falling , rising up again and running around with an utmost glee. Everyone around, was laughing seeing this playful sight of Bhagat. Soon, the young kid uttered the words, “I’ll grow guns in the whole field once I grew up”. Such was the impact of the revolutionary activities at home on Bhagat since a very tender age. His father immediately took the young Bhagat in his lap and kept caressing him for long with teary eyes. Bhagat was sent to a primary school as a kid. After the sad demise of his elder brother, Jagat Singh who was just 11 years old, Bhagat’s father moved his family to Navakot, Lahore. It was a customary tradition to admit students into Khalsa schools but those schools respected English and Englishmen. Sardar Kishan Singh was a true patriot and he wanted his son to get an education from an institution where even the shadow of slavery couldn’t reach. In 1916, Bhagat was admitted to DAV School, Lahore where he received education about English, Urdu and Sanskrit. He developed a strong inclination towards Sanskrit and even used to write letters to his grandfather in Sanskrit. In 1919 took place the Jallianwala Bagh massacre. Numerous unarmed innocents were butchered by General Dyer. The massacre invoked in every Indian a pledge to shook the very foundations of British Raj in India. Bhagat Singh and his family soon reached Amritsar from Lahore. The immense bloodshed and thousands of corpses that filled the Jallianwala Bagh shook Bhagat to the core. He belonged to the third generation of the family of patriots. He pledged then and there to sacrifice himself so as to freed his motherland from the brutal atrocities of the Britishers. He took the blood-filled soil in a bottle as a mark which remind him of his pledge to avenge the insult born on his country and countrymen. Many schools and colleges imparting feelings of nationalism and portraying the national education part excellence were established in prominent cities under the influence of Non-cooperation movement. Lala Lajpat Rai had established National college in Lahore. It was affiliated to Kashi Vidyapeeth. Non-Cooperation was a call of Gandhiji for every Indian government employee to leave their jobs and designations, for every student to leave their schools and colleges as a mark of protest. Bhagat left his school too, he was then in the ninth standard. He instead, joined Lalaji’s National College at Lahore. There he developed deep interest in history and politics. He was drawn towards Prof. Jai Chand Vidyalankar who used to teach history in the college. Prof. Vidyalankar used to remain in contact with the revolutionaries and narrate the revolutionary activities being planned by them, to Bhagat Singh. He was in fact, Bhagat’s political mentor. Bhagat also developed a keen interest in dramatics. He successfully used to portray roles of Shashi Gupta, Rana Pratap, of characters in ‘The Mahabharta’ etc and his performances met with accolades from his colleagues and teachers alike. He enrolled himself as a member of National Night Club. Since, the motto of the drama club was to invoke feelings of patriotism and nationalism in the minds of public, by staging plays, this club was soon banned by the British government. Bhagat Singh taught himself about Marxism, communism and revolutionary history. He was in awe with patriotic poems and literature. He could be often heard humming a patriotic song in Punjabi. Bhagat was a staunch oppose of Gandhi’s ideas of non-violence. He had resentment for Gandhi’s so called moral and philanthropical ideas. Bhagat was agitated over the fact that in Chauri-Chaura when a peaceful crowd of masses was marching in the city so as to show their contribution towards Non-Cooperation movement, policemen fired bullets over the unarmed people until all their arms and ammunition’s got over. People were forced to retaliate and burned the police station down killing 21 policemen. Gandhi decided to call off the movement following the incident but said not a word condemning the acts of police. Bhagat was raged by this fact so as to what was the need of calling the movement off when the country was so near to obtaining its independence, subverting the psychology of the common men and dampening their strength altogether. Bhagat when started pursuing B.A started to devote himself more and more in the social activities of Naujawan Bharat Sabha (Youth Society of India) which he had himself established in March 1926. 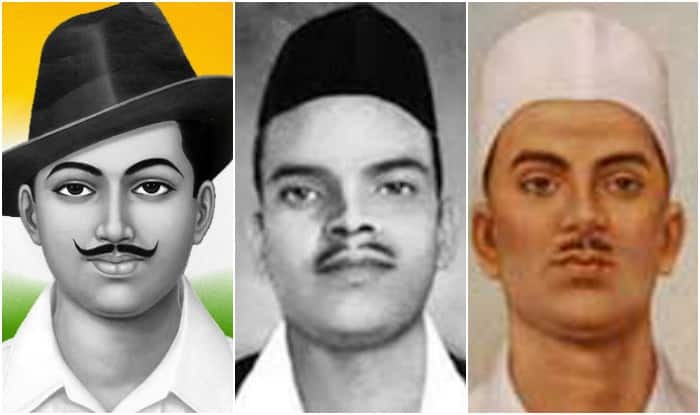 He also joined Hindustan Republican Association in 1926 which had prominent revolutionaries like Chandra Shekhar Azad, Ram Prasad Bismil and Ashfaqulla Khan. However, pressure of marriage at his home began to grow. His grandmother wanted to see her only grandson getting married so, Bhagat’s father wrote him a letter asking him to get married. Bhagat politely refused stating that, ‘He has sacrificed himself to the cause of freedom of her motherland and none could come in its way’. He fled to Kanpur (then Cawnpore) to devote himself full-fledged in realization of his dream. He began writing his opinions in several Punjabi and Urdu newspapers published in Amritsar. He also contributed to the pamphlets published by Naujawan Bharat Sabha that excoriated the British. He often used pseudonyms such as Balwant, Ranjit and Vidrohi. The growing influence of Bhagat’s ideals, opinions and activities upon youth frightened Britishers and they arrested Bhagat on the pretext of bombings carried out on Dussehra in 1926. He was arrested in October 1926 but subjected to bail later, on a surety amount of Rs 60,000/-, five weeks after his arrest. This brief imprisonment didn’t subdue his activities. In September 1928, a meeting of revolutionaries across India was called under the banner of Kirti Kissan Party held at Delhi. Bhagat Singh was the secretary of the meet. His later revolutionary activities were carried out as the leader of the association. Bhagat also wrote for Kirti, a journal published by the Party and briefly for a newspaper, Veer Arjun in Delhi. Following India’s contributions and aids during the First World War provided to the British, India was promised setting up of a committee comprising of member representatives from Britain and India to look into providing freedom to the country. Britishers, as was expected of them denied setting up any committee later but given to the pressure built from the opposition party in Britain and from leaders of India, formed a Simon Commission presided over by Sir John Simon to report the current political situation in India in 1928. It was a blow to Indians as none of the elected members of the Commission were Indian. When Simon Commission arrived in Lahore on 30th October 1928, a peaceful demonstration was carried out under the leadership of Lala Lajpat Rai but the police rather decided to attack the unarmed protestors violently. The police superintendent, James A. Scott ordered to lathi charge over the crowd while personally beating Lala Lajpat Rai. Lalaji succumbed to his injuries and died of a heart attack eighteen days later in the hospital. This was an insult to the tolerant masses of India and the revolutionaries like Bhagat Singh, Chandra Shekhar Azad, Jai Gopal, Rajguru, Sukhdev vowed to avenge Lalaji’s death. They plotted to kill Scott. However, they mistook John P. Saunders, Deputy Police Superintendent to be Scott and killed him rather. Jai Gopal signalled Rajguru and Bhagat Singh when Saunders was returning from his office duty at District Police Headquarters in Lahore, on a motorbike. With a single shot of Rajguru, Saunders fell on the ground but Bhagat short several more in his chest and legs to ensure his death. Then, together they fled the spot. Chandra Shekhar sitting on the wall of D.A.V College, whose entrance the revolutionaries had planned to use as an escape, shot an Indian constable, Charan Singh who was running behind Bhagat and Rajguru to arrest them. Soon, they pre-planned posters were set up, where the Hindustan Socialist Republic Army publicly owned the act of killing Saunders as act to avenge Lalaji’s Death. Although the murder, as was expected, was condemned by Gandhi but Jawaharlal Nehru wrote, “Bhagat Singh did not become popular because of his act of terrorism but because he seemed to vindicate, for a moment, the honour of Lala Lajpat Rai, and through him the nation. He became a symbol, the act forgotten, the symbol remained, and within a few months each town and village of Punjab, and to a lesser extent in the rest of Northern India, resounded with his name. Innumerable songs grew about him and the popularity that the man achieved was something amazing”. In the face of actions by the revolutionaries, the British Government enacted the Defence of India Act to give more power to the police. The purpose of the Act was to combat revolutionaries like Bhagat Singh. It got rejected due to its motto. However, it was reintroduced in the Central Legislative Assembly as an ordinance that claimed to be in the best interest of the public. In response, Hindustan Socialist Republic Army (HSRA) decided to bomb the Assembly to show their opposition towards the ordinance where it was going to be passed. The idea was brought into foray by Bhagat Singh himself who got inspired by a martyr anarchist, Auguste Valliant who on the similar lines had bombed the French Assembly. A meeting of HSRA was called upon to discuss the plan. It was decided that after the bombings, that Batukeshwar Dutt and Bhagat Singh who were to cause the bombings will flee from the spot taking the advantage of huge amount of smoke oozing out of the bombs after explosion. However, Bhagat Singh wanted a voluntary arrest so that it could cause an upsurge among his followers for the re-initiation of the conquest of freedom. On 8th April 1929, Singh and Dutt threw two bombs onto the corridors of the Assembly and shouted the slogans ‘Inquilab Zindabad’. They didn’t flee the spot as was planned but rather threw leaflets onto the members of the Assembly that carried the words, ‘Loud noises to make the deaf hear’. It subsequently led to their easy arrest and were put on trial. Chandra Shekhar Azad, Sukhdev and others sent letters to Bhagat Singh in jail of informing him that they had planned his escape from the jail premises but Bhagat denied, stating that he wanted to use this opportunity of his trial and execution to ignite the feelings of independence in his countrymen yet again. The bomb neither killed nor harmed anyone as was proved by the substantial by the forensic reports carried out by the British investigators, that the bombs weren’t powerful enough to cause high casualties. Dutt and Bhagat claimed that it was deliberate done by them also the bombs were exploded in the corridors away from the people. However, the Financial member of the Viceroy’s Executive Council, George Ernest received some injuries. Citing his injury, the shrewd government sentenced life imprisonment to Dutt and Singh on 12th June 1929. In 1929, HSRA has established bomb factories in Lahore and Saharanpur. On 15th April 1929, Lahore’s bomb factory was discovered by the British government that lead to eventual arrests of Sukhdev, Rajguru, Kishori Lal, Jai Gopal and many other revolutionaries. Soon, the Saharanpur’s factory was also raided and many more arrests were made. However, as many as seven revolutionaries turned as informants who revealed miniscule details about the assassination of Saunders, Assembly blasts and other plans of HSRA. Bhagat, Sukhdev, Rajguru and 21 others were charged with the conspiracy and murder of Saunders. Singh, now serving life imprisonment was re-arrested for the murder of Saunders as per the substantial evidences plagued in by his associates Jai Gopal and Hans Raj Vohra. His life-sentence was deferred until the trial of Saunders’ murder case. Bhagat used his court trials as a medium to publicise the cause for India’s independence. Seeing his popularity grow and the youth supporting his fervour, Bhagat was exempted from the court trials and was subjected to change of prison from Delhi jail to Central Jail Mianwali. Bhagat there met with discrimination between Indian and European prisoners. Bhagat Singh along with other prisoners launched a hunger strike advocating the rights of Indian prisoners. The aim of their strike was to ensure a decent standard of food for the political prisoners, the availability of books and a daily newspaper coupled with proper toiletry necessities and hygiene facilities to be taken care of. In addition, Bhagat demanded that the political prisoners shouldn’t be imparted any labour or undignified work. During his hunger strike, that lasted 63 days, he gained much popularity among common Indians. The Britishers succumbed to his demands and Bhagat became famous all over in India before which his popularity was limited to Punjab region only. Mohammad Ali Jinnah too expressed his sympathies for the young revolutionaries upon their hunger strike in the prison stating, “However much you deplore them and however much you say that they are misguided, it is this system, this damnable system of governance, which is resented by the people”. On May 1st 1930, Lord Irwin by declaring an emergency shifted the trial of Saunders’ murder and Lahore conspiracy from the court of Rai Sahib Pandit Shri Hari Kishan to a Special Tribunal of three judges. This Tribunal had the power to proceed with the trial even in the absence of the accused and whose judgement couldn’t be challenged in any other higher court. As was the purpose, on 7th May 1930, the Tribunal sentenced Bhagat Singh, Sukhdev and Rajguru to be hanged till death while twenty-one other accused to life-imprisonment. A plan to abscond and rescue the fellow members of HSRA from jail was made, but Bhagwati Charan Vohra who was making bombs for the same, died while manufacturing the bombs as they accidently exploded. The plan thus, was aborted. When in prison, Bhagat Singh maintained a diary and wrote as long as 404 pages. He made notes of the popular sayings and quotations by various people who had an impact of him. Notable were the quotations from Karl Marx and Friedrich Engels. Also, he wrote a pamphlet entitled, ‘Why I am an atheist’ as he was accused of vanity by not remembering God in the face of death. On 23rd March 1931, Bhagat Singh was hanged in Lahore with his fellow comrades, Rajguru and Sukhdev. His supporters who were protesting his hanging immediately declared him a Shaheed (Martyr). According to the Police Superintendent, V.N Smith, the hanging was advanced. Normally, the hanging used to take place at 8:00 AM but fearing the crowds that had gathered around the premises, the three leaders were hanged a day prior at around 7: 30 PM in the evening. Slogans of “Inquilaab Zindabad” were heard by the people around this time who were sitting outside and the fact was verified. Bharat Maa lost yet another son in the conquest of freeing herself from atrocities of the Britishers. Tears were shed, the Shaheed witnessed a large number of outpouring of people as an honour for the courageous man who with so ease submerged his life for the great cause. Bhagat died but his death corroborated in many a light of independence from this brutal rule in the hearts of many. People will bear now no more. Bhagat was cremated at Hussainwala on the banks of River Sutlej. The Bhagat Singh Memorial was established in his hometown Khatkar Kalan and a museum by the name, “Shaheed-e-Aazam Sardar Bhagat Singh” Museum was established in his maternal village where sand and newspaper drenched in his blood and his half burnt bones have been kept preserved.